There are three ways your organization can report non-conforming or counterfeit part data. 1. The easiest method is to e-mail a copy of your internal failure report or third party test report (supplier or customer information can be removed at your discretion). Please e-mail your report to reportparts@erai.com. The ERAI staff will extract the required data and protect your anonymity. Copies of your actual report will not be posted on the ERAI website unless specifically requested by your organization. 2. You can alternately submit a part using ERAI's Reported Parts Template in Microsoft Word format. This Word document allows you to submit a part report easily on one form for email submission to reportparts@erai.com. 3. You can complete the online Report a Part Form with the required fields and select the "submit" button at the bottom of the form. Once submitted, the reported part will be uploaded to the ERAI internal operations database for vetting purposes. 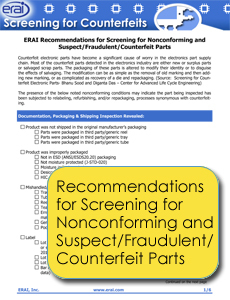 Before making the data available in the ERAI High Risk and Suspect Counterfeit Parts Database, ERAI will examine the part data which may include referencing various tools such as the manufacturer's website, datasheets or other available sources to ensure accuracy and relevance.